Hero Ram is getting ready to test his luck with the film ‘Masala’. He has teamed up with Victory Venkatesh for this movie and Vijay Bhaskar has handled the direction. We caught up with Ram for a small interview and he spoke at length about his upcoming movie. Ram revealed that he was quite apprehensive about his role in the film, but then decided to go for it. Read on to see what he had to say about ‘Masala’ and about life in general. Q. How did this project materialise? A. Venkatesh garu watched ‘Bol Bachchan’ and he called up Pedananna garu (Sravanthi Ravikishore) and pitched this idea. I watched Bol Bachchan and I was apprehensive about the second character. I took some time to say yes. Finally I decided “evaranna dare chesi chesthe better kadha”. I went with it. I never expected that I would do something like this. Q. Was the story adapted for Telugu viewers? A. Yes, The treatment of my character in the film was quite a challenge. We did not want to go overboard as our viewers do not like to see heroes doing such things. More than the film itself, getting this part right was a challenge. Q. You have worked with a senior hero like Venkatesh for the first time. How did you feel? Was there any nervousness? A. No, I was not nervous. I was excited. Everyone looks at things in their own way. For example, if someone is getting ready to do a bungee jump, he/she might feel excited or nervous. It is just the way you look at things. I basically get excited when I do such stuff. I had a great experience with Venkatesh garu. I enjoyed doing the comedy scenes with him. Q. How was the director chosen? A. For about one month after we decided to do the film, we did not finalise the director. I personally felt Bhaskar uncle would be good for the film as he has great entertainment sense. Luckily, everyone else felt the same and that is how we picked him. He does not get upset or worried easily and he is very capable. A. Honestly, I have not decided anything. I am buying scripts and keeping them aside. I am also listening to big banners and directors also. Tollywood is currently giving more importance to combinations rather than scripts. I do not want to fight that trend. I will go with it but at the same time, I would like to do some things my way. A. I really don’t know. If I like a script, I can tell you minute details even after a year. But if I don’t like it, I just can’t remember anything about it. When someone narrates a script, I will think about 4 – 5 different ways in which the story can move forward. If the narrator comes up with a 6th way, I probably will get excited about it. I personally like entertainment a lot. Q. Tamil and Malayalam actors are doing a lot of experimental, low budget film. Are you open to do something like that? A. “Andhari directors ki nannu choosthe experiments cheyyalanipistundhi” (Laughs). For example, I wanted to do a Karunakaran kind of love story. But he tried something different with me. The same thing has happened before. I am actually quite happy about this, as this shows I excited directors. As for low budget films, our Telugu viewers like to watch films with rich production values. We love big and massive sets. Things are different in Tamil and Malayalam. There is nothing wrong with it. Every section of viewers will have specific tastes and we must cater to that. Q. Do flops upset you? A. In the days after ‘Jagadam’, I was quite depressed. “preminchina ammay ni intlo oppukokapothe, entha depression ostundha ala undedhi” (Laughs). My career has a lots of ups and downs, like the Indian Stock Market. I am more balanced now and I keep learning from my mistakes. Q. Who is your anchor in life? A. 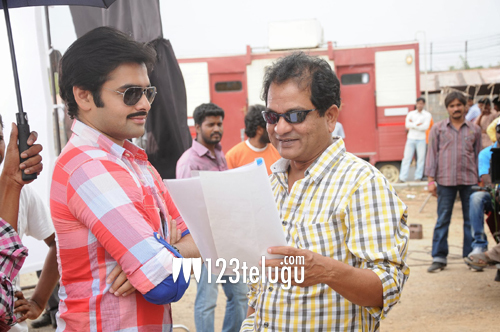 From an industry perspective, pedananna garu is there. I am very close to my family. Basically, an actor needs balance. There are instances where it is easy for you to snap. For example, a relative might be dead but I might need to go and do a comedy scene. So, there will be moments of eccentricity for an actor. Q. Are you interested in other aspects of filmmaking? A. I love all aspects of filmmaking. But I will not be getting into them. “Music sense undhi kadha ani music director aypokudadhu”. You must use it to get good music from the music director. The same thing applies to every other department. Production, I can’t help it because my family is involved. A. I spend a lot of time with my family. I also try to come up with new concepts, be it in dance or with respect to scenes etc. I feel relaxed when I do that. Q. What is the biggest USP of ‘Masala’? A. From start to finish, the movie is a laugh riot. In fact, except for the interval, you will keep laughing constantly. The movie is hitting the screens on the 14th of this mont, so please do watch it. With that, we wrapped our conversation with Ram. Let us wish him the very best for his movie.